Deze pagina is in het Engels om zoveel mogelijk mensen de kans te geven om de data te gebruiken. Up till 2015 we have been collecting the data for Openspending.nl ourselves. Nowadays, Statistics Netherlands (Centraal Bureau voor de Statistiek/CBS) releases most of the data and thus has become our main source. 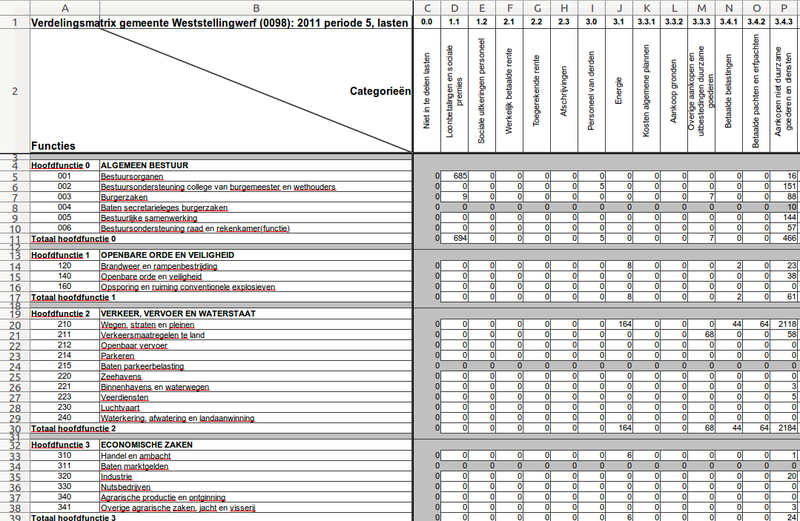 Every government body (municipality, province, ‘waterschap’ and ‘gemeenschappelijke regeling’) reports their financial information to the CBS in a standardized format called ‘Informatie voor Derden‘ or ‘Iv3’. More information can be found on the website of Bureau KREDO (the department within CBS which deals with the Iv3 data). This page gives more details on their release of open data and here is a direct link to their API. You can also use our API, see the section below, which has an easier way of accessing the data and also contains metrics for the governments. We’re also publishing financial data on a more detailed level in cooperation with several government bodies, so-called ‘detaildata’. See this example for the detaildata of the municipality Groningen (click on the ‘Detail Data’ tab). Read the posts regarding the detaildata of both the province Groningen and the municipality Groningen (Dutch) or this post on the detaildata of the municipalities of Dordrecht, Heerlen, Lelystad, Oirschot and Utrecht. This detaildata can be found here in a ZIP file. You can also access this data through our API, see the section below. As you can see, we have 19 endpoints. Each endpoint supports retrieval of a (filtered) list of items or just one item using the item’s ID. The first 10 endpoints contains aggregations (also known as facets) and normal access to the Iv3 data, while the other 9 ‘transactions’ endpoints contain the ‘detaildata’. On the vertical axis (on the left) you see the functions to which a value can belong, e.g. “210 Wegen, straten en pleinen” (roads, streets and squares). We call these “subfunctions” or “sub” as we also allow you to extract the data on the “main function” or “main” level, e.g., “Hoofdfunctie 2 VERKEER, VERVOER EN WATERSTAAT” (Main function 2 TRAFFIC, TRANSPORT AND WATER). Such a value is not simply 1 number, but broken down into the “categories” or “cat” you see on the horizontal axis (on the top). In the case of “210 Wegen, straten en pleinen” its expenses were spent as follows: 164 was spent on “Energie” (energy), 44 on “Betaalde belastingen” (paid taxes), etc. Note that all these values are divided by 1,000 (one thousand). So the actual spending on energy was €164,000. In our API, we call these values “entries“. Only cells with an actual value are stored in our API. Another term used in the API is “document“. This relates to the Excel forms shown above. Each Excel form is one document and thus contains the values for one government body for a certain year and period. The local government bodies send the CBS up to 6 of those documents per year, called periods 0 till 5. A document with period 0 contains the budget for the whole year ((jaar)begroting), periods 1-4 contain the actual spending (realisatie) for each quarter of the year and period 5 contains the spending of the whole year ((jaar)realisatie). Some governments also submit quarterly budgets to the CBS. This are adjusted budgets as in ‘budget per quarter’. Our Openspending Lijstjes website makes uses of our own Openspending API (eat your own dog food ;D). Its code is posted on GitHub. Check out this source file to see which calls we make to our API so you get an idea of how you can use it.